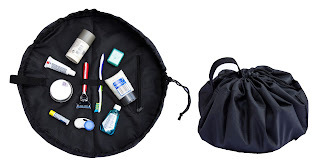 It seems I am always on the go and recently got this ModFamily Toiletry and Cosmetic Cinch Bag to help carry some of the necessities while I am out and about. This toiletry bag is large enough to hold your basic toiletries without being too big. It easily holds your toothbrush and paste, razor, cosmetics, etc, and opens into a flat tray so you can easily find whatever you need. After use, just cinch the bag back closed and go on your way. Like I said, it isn't huge, so would work well for a child, man or a woman, just don't expect to be able to carry tons of extras. Ladies, if you need a separate suitcase for your makeup, hairdryer, and other items, this might not be big enough for your needs, but it will hold the basics. I used it for my toiletries a couple of times now and it worked well. I have also used it to carry a few small toys when visiting my grandchildren. I think that this bag could come in handy for other purposes as well, and I like that the black color works well for everyone. Although I got this product at a discount or received a complimentary sample in exchange for my honest review, all thoughts and opinions on the products I review are always my own and have not been influenced by any discounts or samples which may have been provided to me for testing purposes.